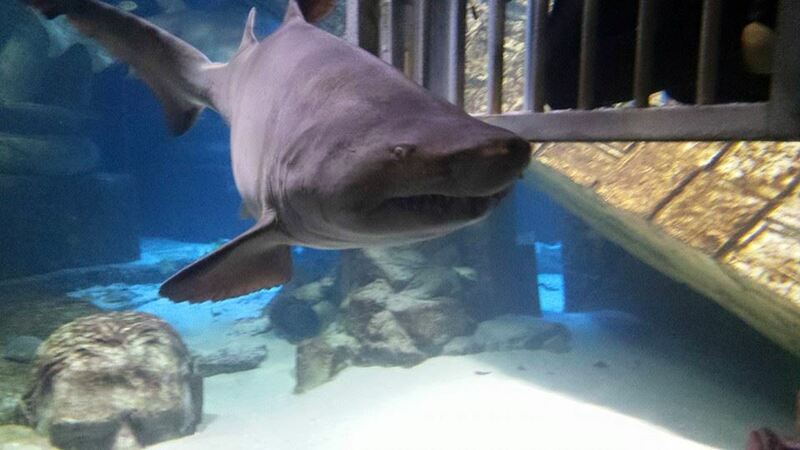 Mark Cuban’s got nothing on these sharks! 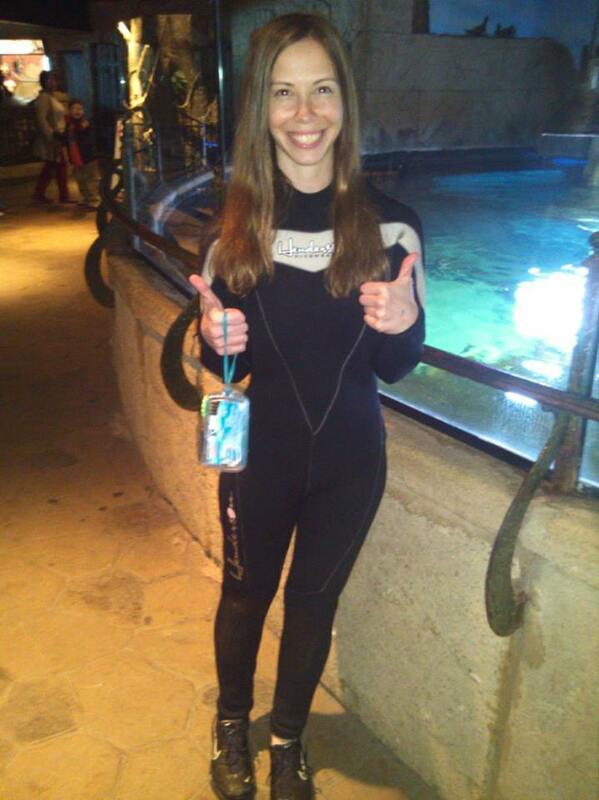 Yesterday I went to the Long Island Aquarium and Exhibition Center and made quite the splash. In other words, I took a chunk of my most recent paycheck and put it towards being locked in a cage and reeled down into a tank swimming with sharks — eight of them to be exact. So why did I put myself in this oh-so-dangerous situation? Why would I want to spend 20 minutes under water with nurse sharks and sand tiger sharks with only pieces of metal in between us? My first answer is because it’s not your ordinary daily activity — it’s an adventure — I felt alive down there, doing some crazy thing for the first time. Life is all about experiences, and this bucket-list-esque want of mine was possible, so I did it. I’ve also gained respect for these cold-blooded creatures. Having them inches away from my face, seeing their strongly-built swaying bodies and rows of sharp teeth is a powerful thing. It made me feel small and great at the same time. In the wild I’d never get this close to these magnificent creatures! So there’s that. 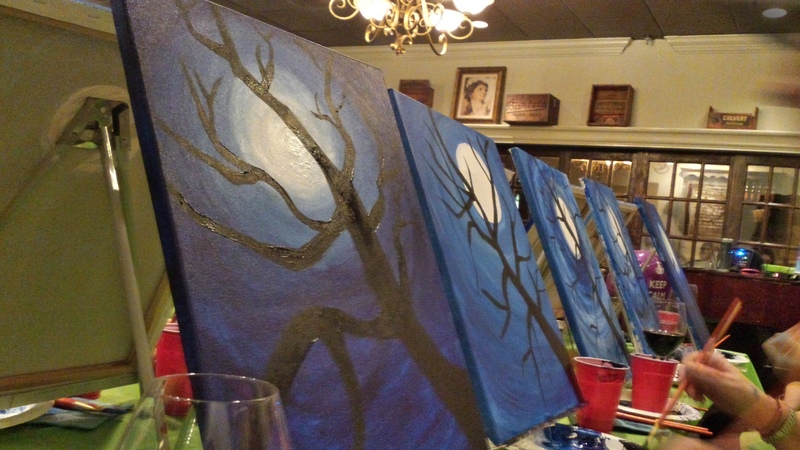 No matter if you’re an experienced artist who can work up a masterpiece with a few strokes of a paintbrush, enjoy dabbling on a canvas as a hobby, or have no artistic experience at all, it’s easy to express yourself at Paint Nite. This new concept blends two timeless pastimes: artistic painting and drinking cocktails, as a way to draw patrons into local pubs with the opportunity to be creative and socialize. Paint Nites, which are two hour step-by-step painting classes with a nice glass of whatever-you’d-like, are held daily around the country, each with 25 people in attendance. Since I’m drawn to anything artistic, Paint Nite caught my attention, so I signed up for the spring blossoms painting this past Thursday night at a wine bar. It was a fun, cheery way to welcome the spring. Since the classes fill up ahead of time, I signed up about a month in advance, when there were only a few seats left. It was the weekend before St. Patrick’s Day and the manfriend and I were hanging out in the Big Apple for the day. We had some time to kill before our final destination to see a rock show in Brooklyn, so we decided to scope out a spot for appetizers and drinks, preferably near the R train, so we stuck nearby the Herald Square area. From way out in the foggy, rainy distance we saw a giant shamrock and yellow vertical letters that spelled out “Brendan’s.” It sounded Irish enough, so away we went, Brendan’s-bound. 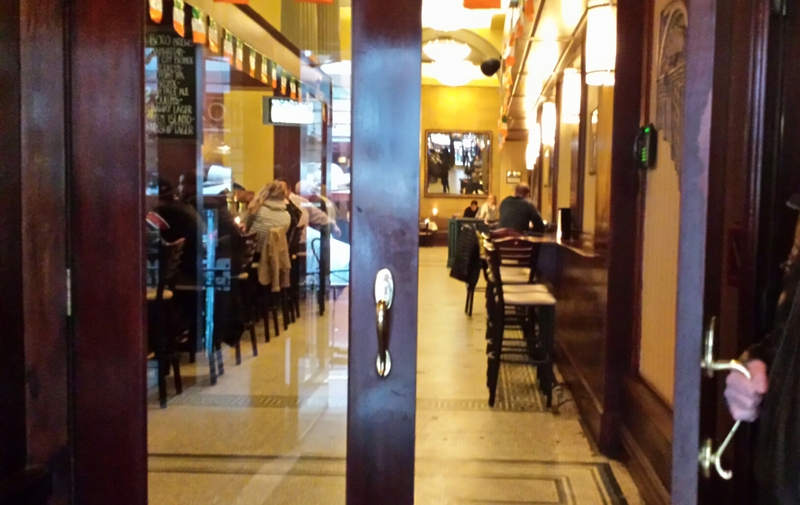 We were expecting the typical Irish pub: dimly lit, small and cozy, bottles of alcohol lined up behind a bar that took up pretty much the entire place. 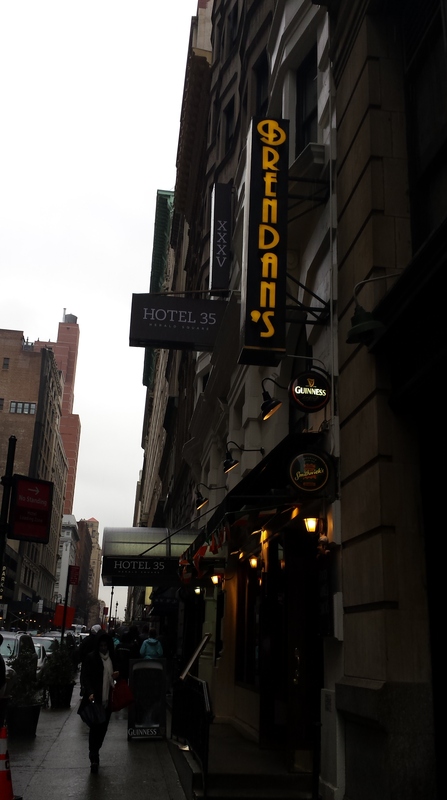 But Brendan’s was a place of its own. Let’s step inside and you’ll see what I mean. 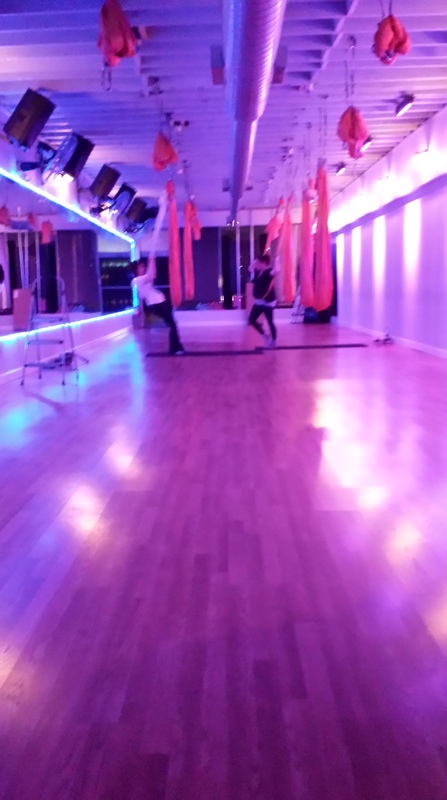 I swung over to a small fitness studio for my first AntiGravity Flying Fitness class tonight. Sounds cool, right? But you never heard of it, have you? Up until last month, neither did I. While browsing around for a fun, fit activity, this crazy form of working out caught my attention and I had to give it a whirl. I’ve seen pictures and watched videos before stepping into the studio, so I went in knowing what to expect, but what I didn’t know was how challenging I’d find it to be. The AntiGravity Flying Fitness studio I hung out in. I went it, filled out an emergency contact form, grabbed a squishy rubber mat and set it up beneath one of the unrolled orange hammocks hanging from the ceiling. Once everyone was ready, my instructor introduced herself and then proceeded to, in a soothing yoga-sounding voice, walk us through hopping into the hammocks and then got us going with some warm-ups. An article I wrote for Long Island Trends Magazine. Looking to have the time of your life? 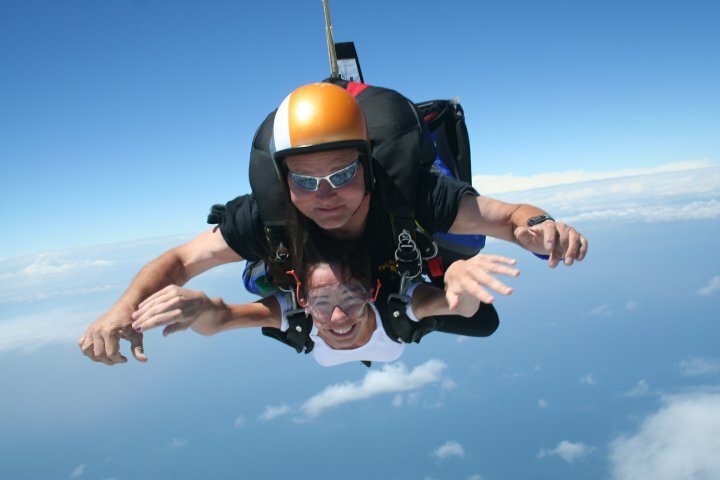 Make this summer soar above the rest and plunge into the sky at Skydive Long Island, located in the beautiful town of Calverton. Take things to the extreme and swoop into the blue from 13,500 feet up to experience the world above the clouds. Enjoy breathtaking views of Long Island’s wonderful scenery, including the famous twin forks, the Hamptons, and the Atlantic Ocean. On a clear day, you can even spot the New York City skyline, about 70 miles away. Me, on top of the world, June 2010. To jump, you must be at least 18 years of age and no more than 225 pounds. No experience is necessary. You’ll be attached to a fully certified, topnotch skydiver, with thousands of jumps beneath his/her belt. Leave it to your instructor to pull the two parachutes and enjoy the energizing ride.